St. James is blessed to have an active, dedicated Altar Guild of eighteen women. 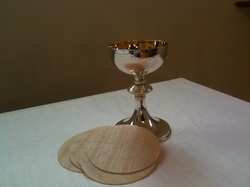 The Altar Guild prepares the altar for weekly worship and maintains all the linens and vessels for our services. The Guild also arranges the altar flowers for all services, baptisms, confirmations, and burials. We are blessed for and thankful to each of you who have given financial support for the purchase of our altar flowers and our numerous supplies. Please understand that the donations not only pay for the flowers, but also provide the bread, wine, candles, oil for the candles, and the altar linens and their cleaning. It also provides for all of the vestments and altar hangings and their care. We hope that you will continue to remember memorial and thanksgiving donations to St. James. There are many Sundays where contributions are given for thanksgivings and memorials. We cannot operate without your spiritual and financial support. If anyone is interested in becoming a member of the Altar Guild, please contact Colette Tarantino. We also accept donations for the work of the Altar Guild.